Linlin Liu, a doctoral candidate in Economics, recently received one of the Nanovic Institute’s Dissertation Fellowships. But before that, she received two Graduate Professional Development Grants to present at conferences. 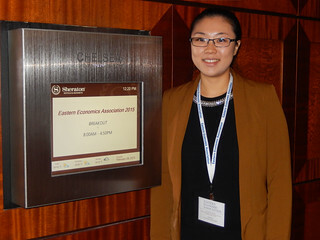 One of those involved presenting her paper, "Life Cycle Portfolio Choice under Time Varying Equity Premium and Risky Labor Income" at the Eastern Economic Association's 41st Annual Conference in New York. Yes, this is related to Europe; we promise! To find out how, and to learn more about her experience and the benefits she received, continue reading! In my paper, I examined individuals’ decisions to allocate labor income among risky assets (stocks) and safe assets (government bonds) over the life cycle, as well as the impact of their investments on the financial market as a whole. The theoretical model I developed in my paper suggests that changing trends in asset accumulation and portfolio choices of financial market participants over the life cycle lead to changing supply-demand dynamics for assets and affect asset prices. I documented data on asset demands in the European Union Countries and Emerging Market Economies and found that as individuals approach their retirement age, they shift investments from risky assets to safe assets. As the first generation of baby boomers enter retirement age, Europe and the rest of the world are facing a stunning demographic transformation to aging populations. By 2025, more than 20% of Europeans will be 65 or over. The dramatic aging issue will have a significant impact on the demand for safe assets and the stability of financial markets in the decades to come. While there is a common trend in population aging in Europe, the timing and stage of the demographic transitions differ among the European countries. The youngest countries in Europe are Ireland, Cyprus, Slovakia and Poland, and the countries which are facing severe issues of aging are Spain, Italy, Germany and Sweden. With the promotion of the Economic and Monetary Union (EMU), the European market, especially across the Euro-zone countries, is increasingly acting like one market. Investors can invest in bonds issued by the country in which they live as well as in bonds issued by other governments. If national economic policies encourage free mobility of capital, then the investors in the aging countries can freely invest in the bond market of the relatively young European countries. As a result, the demand and supply of safe assets will balance and the asset prices will remain stable. Therefore, based on my research results, economic policy making in EMU countries should act to support the single market in order to sustain financial stability. The Eastern Economic Association Annual Conference provided me with a great opportunity to talk to economists about the issues of aging and asset demand. I presented my paper in the session of Risk and Anchoring Bias and Stock Returns. All the presenters in this session work on analyzing asset dynamics and are familiar with the literature. After the presentation, researchers from different regions of Europe and around the world formed a group discussion. I was able to establish professional relationships with other young scholars and senior researchers and received insightful feedback on my paper. For example, researchers from University of Helsinki work on analyzing the optimal portfolio allocation problems and its impact on the asset dynamics. Both of our work focus on how to allocate wealth among different risky assets and how the allocation drives the asset prices. We discussed and compared our models and established the possibility of future research collaboration. The Eastern Economic Association Annual Conference also promoted my professional development. It provided me with a great platform to communicate with job market candidates from around world. Getting familiar with the topics that the job candidates are currently working on and the job market interview procedures are critically important for me to prepare myself for the job market next year. Moreover, attending other sessions in the conference was beneficial for my research. I went to the session on International Finance and Markets, and Patricia Peinado’s paper “On the Origin of European Imbalances in the Context of European Integration” provided me with great insight for my research on unification of Europe. Researchers from IZA, University of Grenada and Bar-Ilan University presented their paper “Micro- and Macro Determinants of Health: Older Immigrants in Europe.” Even though this paper is not directly related to my paper, knowing the economic research frontiers on European issues is beneficial for me to extend my research fields. The Eastern Economic Association Annual Conference was essential to both my academic and professional development and I truly value the Graduate Professional Development Grant which enabled me to attend the conference and have this precious experience!